I love weekend bartending. For four or six or eight people, it’s fun to make and shake. In fact, when I retire, if I retire that is, I plan on opening a B&B: a bar and brownie establishment. A good bourbon, neat, can go a long way paired with a deeply frosted brownie. In the meantime, I keep my day job. And my weekend job of help Suzie when we party. So, I can handle those four+ people with ease. But, playing bartender for ten or more, well, that’s different. I end up wishing I had another pair of hands or so. I’m not well coordinated so quickly pouring and dashing among bottles can be a tad overwhelming. There are spills, and sticky juice and sugar on Suzen’s marble countertop. Some sins are forgiven. Some are not. Some are just sticky. To make beverage serving, and the construction feasible, it is time for punch. And when the summer days are hot, definitely time for punch. That picture above is meant to inspire your summer imagination. 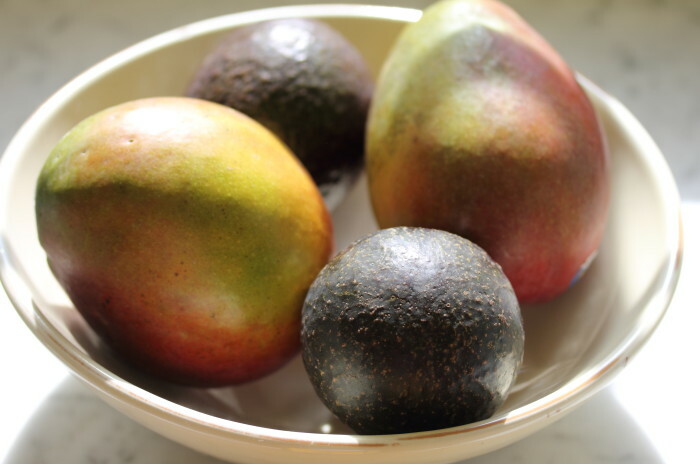 Avocadoes are destined for guac, or salsa, or salad, or to top off a trout. The mangoes? Time to drink. This wonderful mango punch is fruity with a soft punch. There’s far more fruit juice here than rum. The result is pleasure without any sense of dizziness. There’s plenty in the outside world to make you dizzy or perplexed. What you need is something breezily sweet with just enough alcohol to let your relax and dream about life six months from now. You know, when it will be the middle of January and you won’t be drinking tropical juice with your rum! Just rum with rum. This recipe comes from Punch by Colleen Mullaney, potent little book. As with any punch, experimentation and personalization is open for you. Peach juice can substitute for the apricot. Banana nectar for the guava. It’s tough to go wrong and easy to find your own way to satisfaction. Combine the ingredients in a punch bowl and mix well. Add either several cups of ice or an ice form to bring on the chill. Alternatively, refrigerate for at least two hours before serving, but still do with ice.